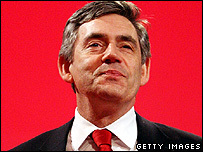 After 10 years as chancellor, Gordon Brown was already well versed in the trials of government when he took office as prime minister. But even he might have been surprised by the succession of crises that greeted his first days in 10 Downing Street. Failed terrorist attacks in Glasgow and London were followed by flooding across much of England. Then, like a blast from the past, foot-and-mouth disease - which forced Tony Blair to delay the 2001 election - returned to terrorise Britain's farmers. Before he became prime minister, the media wondered how the less charismatic - some said "dour" - Mr Brown could follow Mr Blair, a consummate political showman. In office, the new PM made efforts to distinguish himself from his predecessor with a number of announcements, such as reviews of cannabis laws and the government's "super-casino" plan. Mr Brown also invited Tory and Lib Dem politicians to advise him and even some non-Labour figures into ministerial jobs, repeatedly calling for a government "of all the talents". Did this "big tent" approach make him seem above ordinary politics? "Mr Brown has so far managed to sound more high-minded than his predecessor, while acting in a blatantly political way," The Guardian's Michael White wrote. But most commentators noticed a comparative air of calm in Downing Street, echoed in the advertising slogan coined by Saatchi and Saatchi: "Not flash, just Gordon." Voters also seemed quite content, with a "Brown bounce" in the opinion polls still evident after 100 days. With speculation over a snap general election all over the media, Mr Brown, so long the political bridesmaid, seemed to have airbrushed the previous bride out of the Labour family photo album. The Independent noted: "To have dissociated himself in 100 days from 10 years of government and to present himself as the candidate for change is an astonishing achievement." The Labour-supporting Daily Mirror gave the prime minister a school-type report. He was awarded an A+ in crisis management, but only a C grade for his handling of environmental issues. However, no Ds and Es were to be seen. The Mirror said: "Gordon is clearly head boy material but he must make up his mind about what he does next term." In the Evening Standard, Tom Bower, author of a less than flattering biography of Mr Brown, said of the new PM: "Confounding his critics and defying his own character, Gordon Brown has, in fewer than 100 days, proved to be a vote-winner. Mr Bower went on: "The transformation is little less than astonishing. Doubters have been practically suffocated. "But while many wonder whether Brown will capitalise on what appears to be a miraculous reincarnation, others will dig a little deeper to question whether Brown, the master of the Black Arts, will be able to sustain his brilliant performance - and whether his remarkable luck will hold." Criticism of aspects of Mr Brown's performance as prime minister was not hard to find. Much of the press was angry that the prime minister had ruled out a referendum on the EU reform treaty, after Labour had promised a vote on its now-defunct predecessor - the EU Constitution. The Sun and Daily Telegraph were running high-profile campaigns to persuade Mr Brown to change his mind. But positive opinion polls - showing a so-called "Brown bounce" - led to fevered speculation about a snap general election, which the prime minister did little to quell. But, as the 100 days ended, the newspapers had given Tory leader David Cameron several days of positive coverage over his conference speech. To complicate further Mr Brown's decision over whether to call a snap election, the opinion polls were showing a narrowing of Labour's lead over the Conservatives. The Guardian even had the two parties tied on 38%. If Mr Brown's first 100 days started with a series of crises, they ended with some very big choices to be made. "Driving Tory MPs to despair with her half-heartedness"
"There is not the air of intrigue and suspicion that used to haunt the Cabinet"
"If the Daddy of the left cannot control extremists, who can?" "He talks too much when he has nothing to say"
"He emerges from his hundred days the best-loved PM in living memory"
"No doubting courage... boxing skills and punching power questionable"
"Tony Blair looks to be right man for these wrong times"
"Hague needs to re-establish his authority and end the sniping"
"The frog in his throat has long way to go to turn into a prince"
"He simply looks like a man who can do the job"
"Media... collaborated in portraying him as a winner"
"The transformation is little less than astonishing"